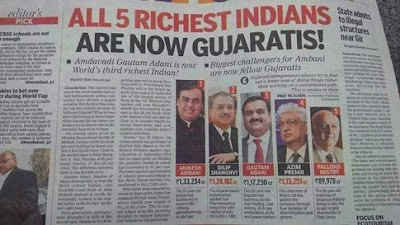 Top British journal “The Economist” has wondered whether Gujaratis, qualified as the world’s “best businesspeople”, would continue to enjoy the same reputation in the future, especially when their image of “religious and ethnic tolerance on which so much of their commercial ethos was built” stands damaged. “Pragmatism and flexibility over identity, and a willingness to accommodate, perhaps inherited from the mahajans, are strong Gujarati traits”, "The Economist" argues quoting Edward Simpson of the School of Oriental and African Studies at the University of London. “The headquarters of the British East India Company was originally at Surat. It was the Gujaratis’ relationships with the East India Company, and later the British crown, that were the biggest influences in shaping their contemporary trading empire”, it says. Calling this as the “secret” behind Gujaratis becoming as one of the world’s most successful businesspeople across the world, the 3,000 word feature, published in “The Economist’s” December 19 edition, suggests, this nature alone is responsible for Gujaratis having spread out across all the countries of world, except for “very small, undeveloped or are merely small islands without much business opportunity”. “They have the added knack of turning a degree into a business opportunity. They own almost half (12,000) of America’s independent pharmacies (as well as one of the biggest chains in Britain, Day Lewis). There are thousands of Gujarati doctors in America, and they are quicker than most to start up their own practices”, the daily says. “Around the globe, they have come to wield huge influence in the diamond business. An impressive 90% of the world’s rough diamonds are cut and polished in the Gujarati city of Surat, a business worth about $13 billion a year, and Indians, predominantly Gujaratis, control almost three-quarters of Antwerp’s diamond industry”, the weekly says. “Unsurprisingly, given their success abroad, they have been at the forefront of India’s own recent economic surge, too. The three wealthiest Indian businesspeople—Mukesh Ambani, Dilip Shanghvi and Azim Premji—are Gujarati”, the weekly says.